Up until I received this copy of Monster Garage, I had no idea of the show's existence. After doing research, I came to see that I am clearly living under a very large rock. The premise of the Discovery Channel show is more of a mach version of This Old House, where mechanics strip down cars (for example, a Ford Mustang) and turn it into a super-charged lawn mower. Needless to say, I am now officially hooked. The new two-disc DVD set features the first four episodes from the hit television show in their entirety, and the sheer thrill that comes from each hour-long episode is almost indescribable. Watching Jesse James and The West Coast Choppers create these massive machines from the ground up is almost the equivalent of watching an inventor see his creation change the world. Sure, the circumstances aren't exactly the same, but there is something about the look in the eyes of these guys that is just amazing. Each episode is a contest: the teams are given a budget of three thousand dollars with which to do as they please as long as it involves transforming the vehicle they're given. Steel is welded together while certain modifications are made to make every car unique. In the end, each team will have to race their creation against a standard issue of the same vehicle they have modified. In the first episode, Jesse and the team attempt to transform a 1993 Ford Explorer into a fully functional garbage truck, complete with hydraulics. As is often the case, there are issues with space as well as budget constraints, but, ultimately, the crew would bring to the world the first cross-over garbage/SUV vehicle. Next up for Jesse is the transformation of a Lincoln stretch Town Car into a fire truck, complete with a retractable hose and a working water pumping system. This particular transformation calls for many more creative inventions, cranking up the level of tension as the deadline draws near and the budget evaporates. The final two episodes deal with transformations that are simply entertaining. The first is a pristine 1990 Mustang GT transformed into a working lawn mower "so that your yard can be done in half the time." The challenge of this episode is simple—the look and placement of the deck—so in terms of excitement, this episode is somewhat lacking. But how can you resist the idea of a Mustang lawnmower? The best of the collection comes last, a Volkswagon Bug that will become a swamp boat, complete with rudder and all the trimmings. Truth be told, the site of a VW Bug being stripped and reassembled was a treat for such an anti-Bug person such as myself, but this is one episode where the viewer will likely be shaking their head in disbelief. Monster Garage is a true original that has earned its following. After watching this DVD set, I am hooked, and the show has earned a permanent place on my TIVO. Image Transfer Review: Presented in a full-frame transfer, Monster Garage looks fairly average, but given the subject matter and the fact that these episodes were filmed when the show was in its infancy, not much can be expected. Generally, the entire transfer boasts only average quality from the colors which are slightly subdued, and sharpness and detail are hampered by the overly soft look of the show. Not a great transfer, but this is not really a release in need of pristine image quality. Audio Transfer Review: Sound is straightforward Dolby Surround that is limited largely to the center speaker. Dialogue sounds crisp and clear throughout with no distortion. Extras Review: No extra features have been provided, though each episode is divided into thirteen chapter stops. 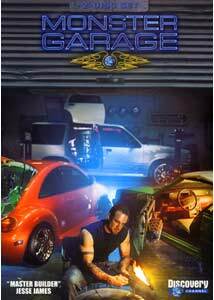 For someone who is not the least bit interested in auto mechanics, I found Monster Garage to be an absolute delight. The creators finds a way to reach down to the twisted inventor in all of us. This DVD is pure entertainment. Highly recommended.